This is your opportunity to own a wonderful sprawling 5.07 acres of land in the Pemberton Creek subdivision. Along with the two side by side lots (10 and 9) is a Spanish hacienda styled ranch home with Asian influences noted in the decorative gates arched drive way entrance & the Asian fly away styled tiled roof. Indeed this 2-story 2724 sq. ft. 3-bedroom 3-bath home has some unique features: a combination formal living room with a raise dining room a 1st floor office a large kitchen a family room that spans across the back of the home & overlooks the covered back porch & pool & even a pool bath & utility room. Nestled into the left side of the house & pool area is a picturesque pond. Spacious pool decking & a covered porch plus a large open upper balcony add to the great outdoor feel of this home. The unique tile floor entrance & family room is charming as is the key hole arched way from the foyer to the living room. Spaces are designed for entertaining & family fun. Further back from the home site & bridging lots 10 & 9 is a 6-stall stable with a tack room. Groom & ride your horses here. True this home needs interior renovating but it is well worth!! Pemberton Creek is located just off Muck Pond Road at the McIntosh I-4 exit. It has easy access to downtown Tampa Brandon & Lakeland & an executive airport is nearby. 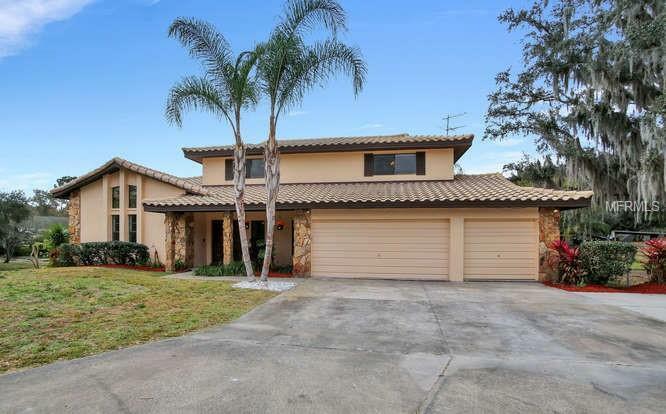 Seffner is a gateway suburban haven for commuters. It is noted for large oak trees strawberry farms & lakes yet it offers the city life of Tampa. See floor plan & site plan. Additional Water Information: Note: Bakers Creek is also at the south edge of the lot and it all flows into Lake Thonotosassa. Pet Restrictions: This is pasture land.